Installation by Drone Dungeon, an evolving collective from San Francisco. Unlike the tripwire sensors that Muybridge used to elucidate sequence, the sensors in this project, when tripped, cause the video to resequence itself at random, and any attempts at reading meaning through narrative are rendered literally inconsequential. Krowswork Gallery is pleased to present Time(Lapse), an exhibition featuring photography, video, and installation by Drone Dungeon, Katja Mater, Kim Miskowicz, and Liena Vayzman. 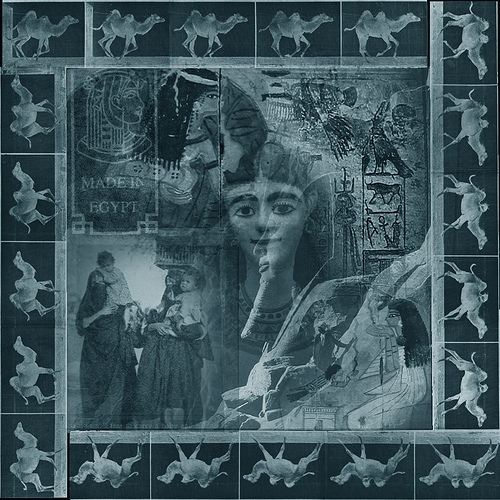 Each of these artists is exploring image degradation through manipulated or natural cycles of time, echoing yet ultimately breaking with the sequential and linear clarity charted by photographer Eadweard Muybridge’s famous “Motion Studies” in favor of a restructuring of narrative and an emphasis on the complexity of the whole. In 1878 Eadweard Muybridge made history by capturing sequential photographs of individual intervals of a horse in motion. By thwarting time in such dramatic fashion, Muybridge positioned himself at the frontier of the moving image, and his photographs seem inseparable from the very trajectory of history he foretold: one in which cutting edge technology would be able to decipher processes that had been up till then literally a blur. But now, in 2010, it must be admitted that the clarity that trajectory portended may not be the actual end result at all. While the artists in this exhibition do not profess to be answering to Muybridge, their specific explorations of time and motion in a photographic medium answer to Muybridge’s experiments 130 years ago, and in some ways their approaches can be viewed as both as a critique and a continuation of the paradigm he initiated. Each of them is working to overlap and condense accumulated motion and time into singular imagery—an effort that purposely nullifies the sequential rationale of the original motion studies and obscures the very intelligibility Muybridge was seeking through them. See movement and time unfold in a new exhibition at Hove Museum. Designed with children in mind, The Moving Image contrasts how movement is shown in both photography and art. Eadweard Muybridge was a 19th century photographer who was the first to develop photographic sequences of moving objects. Placing studies in his famous series Animal Locomotion alongside paintings, engravings and drawings selected from Brighton & Hove Museums’ Fine Art Collection, reveals how artists can represent movement even within a static image. 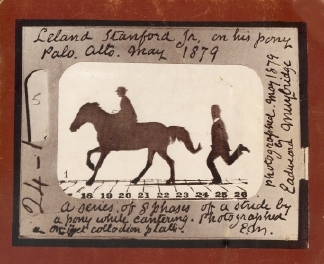 Muybridge’s studies – including cats, horses and elephants – show his understanding of motion as an event taking place in a sequence of phases. Traditionally in fine art, however, movement is communicated through a single significant moment. The Moving Image illustrates the many ways in which we can ‘see’ movement and time unfold. The Moving Image continues in the Fine Art gallery on the upper floor of Hove Museum until September 2010. Admission is free. Eadweard J Muybridge (1830–1904) was an English photographer known primarily for his pioneering use of multiple cameras to capture motion, and his zoopraxiscope, a device for projecting motion pictures that pre-dated the flexible perforated film strip that is used today. Hove Museum also houses a gallery dedicated to the early pioneers of British film. Curator of photography Anita Ventura Mozley, a prominent Muybridge scholar, died on January 23rd of natural causes at her home in Menlo Park, California. As curator of photography at the Stanford Museum of Art, Anita Ventura Mozley organized exhibitions on Eadweard Muybridge, Ansel Adams, Joseph Raphael and Robert Frank. She also expanded the museum’s photography collection. 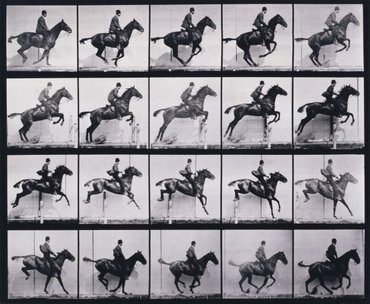 Soon after joining the museum as registrar, she recognized the significance of its comprehensive collection of Muybridge’s stop-motion photographs of the horse in motion, commissioned a century earlier by Gov. Leland Stanford. She was named curator of photography in 1971, and the following year organized her most significant exhibition, “Eadweard Muybridge: The Stanford Years, 1872-1882,” which traveled nationally and internationally. Mozley later wrote the introductory text to Muybridge’s Complete Human and Animal Locomotion (Dover, 1979). After moving to San Francisco in 1962, she worked at the Maritime Museum and married physicist Robert Mozley before joining the Stanford Museum in 1970. Virtually overnight, she initiated the expansion of the museum’s photography collection. In addition to Muybridge, her research included Julia Margaret Cameron, Thomas Annan, Imogen Cunningham, Ansel Adams, Peter Stackpole and Lorie Novak. Mozley’s other memorable exhibitions included “Ansel Adams: The Portfolios,” 1972; “The Grand Tour: Mid-19th Century Photographs from the Leonard–Peil Collection,” 1979; “Paintings by Joseph Raphael,” 1980; “Ansel Adams: Ski Experience,” 1983; and “Images of Hope and Despair: Robert Frank’s Photographs,” 1985. For her 1974 exhibition “Mrs. Cameron’s Photographs from the Life,” Mozley staged Virginia Woolf’s play Freshwater: A Comedy at the museum and cast herself as the main character, Julia Margaret Cameron, who was Woolf’s great-aunt. 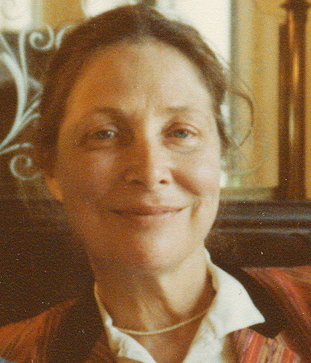 After retiring in 1986, Mozley again took up drawing and painting, and exhibited in California and at shows near her summer home at Southport, Maine. 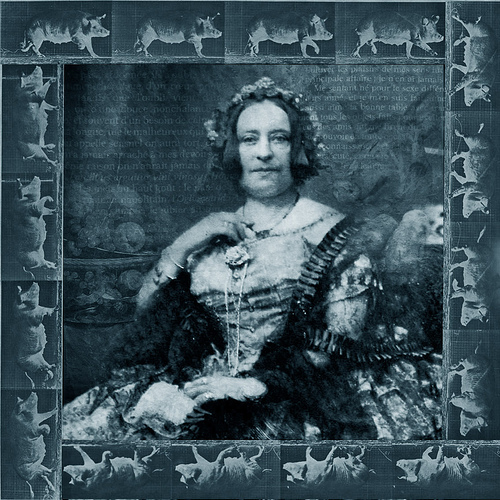 With her informed editing of Eadweard Muybridge, The Stanford Years 1872-1882 Anita Ventura Mozley created much more than an exhibition catalogue. It was in fact the first book to deal exclusively with Muybridge and his work, making clear the scope of the photographer’s many projects, and indicating his influence. Her scholarship was deep and meticulous. When Kevin Macdonnell’s flawed book Eadweard Muybridge, the Man who Invented the Moving Picture appeared in 1972, she commented in considerable detail and with palpable exasperation about the book’s serious shortcomings, after the Times Literary Supplement had simply noted its publication uncritically as a ‘a well-produced picture book’. 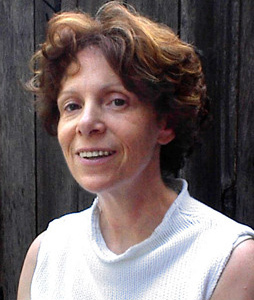 Her detailed analysis of the book’s problems have been useful to subsequent researchers. Anita V. Mozley’s extensive Introduction to the 1979 Dover edition of Animal Locomotion gave a thorough grounding in the subject of Muybridge and his work for the reader (mostly artists – since this is today essentially an art reference publication) who may not have troubled to seek out a biography, and would otherwise have been using Muybridge’s work with little understanding of its origins. Marta Braun, Professor at the School of Image Arts, Ryerson University. Eadweard Muybridge’s 1887 photographic atlas ‘Animal Locomotion’ is a curious mixture of art and science, a polysemic text that has been subject to a number of readings. In her lecture, Braun will analyze the different claims made for the work, and will focus on her discovery of the work’s multiple authorship: the contributions of Muybridge himself on the one hand, and those of his committee members on the other. Marta Braun is Professor at the School of Image Arts and Director of the graduate program in Photographic Preservation and Collections Management at Ryerson University. Her research focuses on Étienne-Jules Marey and Eadweard Muybridge. English photographer Eadweard Muybridge (1830-1904), who pioneered the use of multiple cameras to capture motion, is shown walking heel-first as humans usually do. A new University of Utah study shows that stepping onto the heel first requires much less energy than putting the ball of the foot or the toes onto the ground first. 125 years after they were taken, Muybridge’s photographs are still of value in demonstrating scientific facts. New research at the University of Utah concerning walking uses a Muybridge self-portrait sequence to illustrate the positioning of the foot in walking. Credit: Courtesy of Nature, cover by Justin Libby, Mathieu Baissac and Daniel Lieberman, after photographer Eadweard Muybridge’s 19th century studies of human motion. The study, by University of Utah biologist Dennis Bramble and Harvard University anthropologist Daniel Lieberman, appeared in the Nov. 18 2004 issue. It assembled evidence that humans evolved and human anatomy looks the way it does because our ancestors were more likely to survive if they could run. 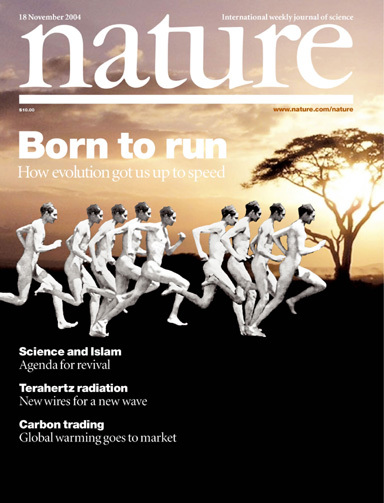 The article prompted a Nature cover picture based on Muybridge sequence photos. Muybridge left a valuable cultural legacy to his home town of Kingston upon Thames. This outstanding collection of material, unparalleled in the world, includes many rare and beautiful objects which provide fresh insights into Muybridge’s phenomenal career. The exhibition wil focus on what could possibly be the most intriguing group of objects, Muybridge’s Zoopraxiscope discs. These 19th-century glass picture discs, many of which have not been on display before, will form the centrepiece of this new interpretation of this phase of his career. The exhibition will link with a major Muybridge retrospective opening at the Tate Britain during the same period. There will also be an exhibition at Kingston University’s Stanley Picker Gallery, which will include contemporary artwork directly inspired by the collection. This working relationship will help to confirm the continued influence of Muybridge into the 21st century. 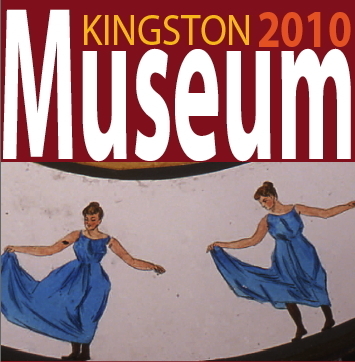 More here on Muy Blog about the Kingston exhibitions, as they develop. In the meantime, for lots more about Eadweard please visit The Compleat Muybridge. (Click on ‘Digital Photomontages’ set). The tone reversal (using a negative image) employed by the artist for the Muybridge component seems to add a degree of strangeness to these Animal Locomotion photographs when used here as border decoration.